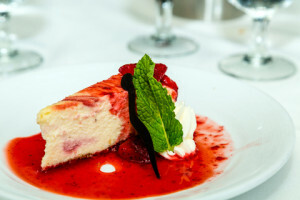 Enjoy a tasty strawberry cheesecake recipe for dessert tonight. This strawberry cheesecake recipe is pretty easy to make. While box mixes are convenient, they are often not quite as good as a cake made the old fashioned way by mixing individual ingredients. It takes a little more time and work, but the results are worth it! 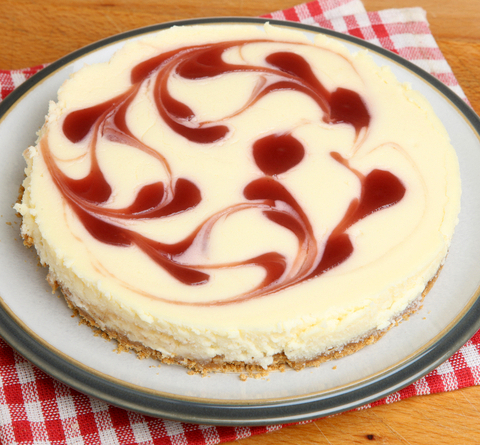 Learn how to make this Tasty Strawberry Cheesecake Recipe and how to swirl the strawberry sauce in the cheesecake by following the simple recipe directions below. I hope you enjoy your dessert tonight! Ready in: 2 hr. 55 min. Combine the graham cracker crumbs, sugar and the melted butter. Refrigerate that for 30 minutes. In a blender, combine the strawberries and cornstarch and process until smooth. Pour into a saucepan; bring to a boil. Boil and stir for 2 minutes. Set aside 1/3 cup strawberry sauce; let cool. Cover and refrigerate remaining sauce for serving. In a mixing bowl, beat the softened cream cheese until light and fluffy. Gradually beat in the condensed milk. Add in the lemon juice slowly; mix well. Add the eggs, beat on low just until it is combined. Pour half of the cream cheese mixture over prepared crust. Drop half of the reserved strawberry sauce by 1/2 teaspoonfuls onto the cream cheese layer. Carefully spoon the remaining cream cheese mixture over the sauce. Drop the remaining strawberry sauce by 1/2 teaspoonfuls on top of that. 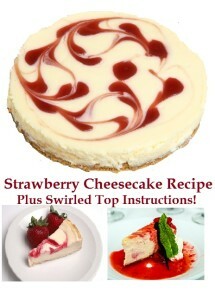 With a knife, cut through top layer only to swirl strawberry sauce. Bake it at 325 degrees F for 50-55 minutes or until center is almost set. Cool on a wire rack for 1 hr. 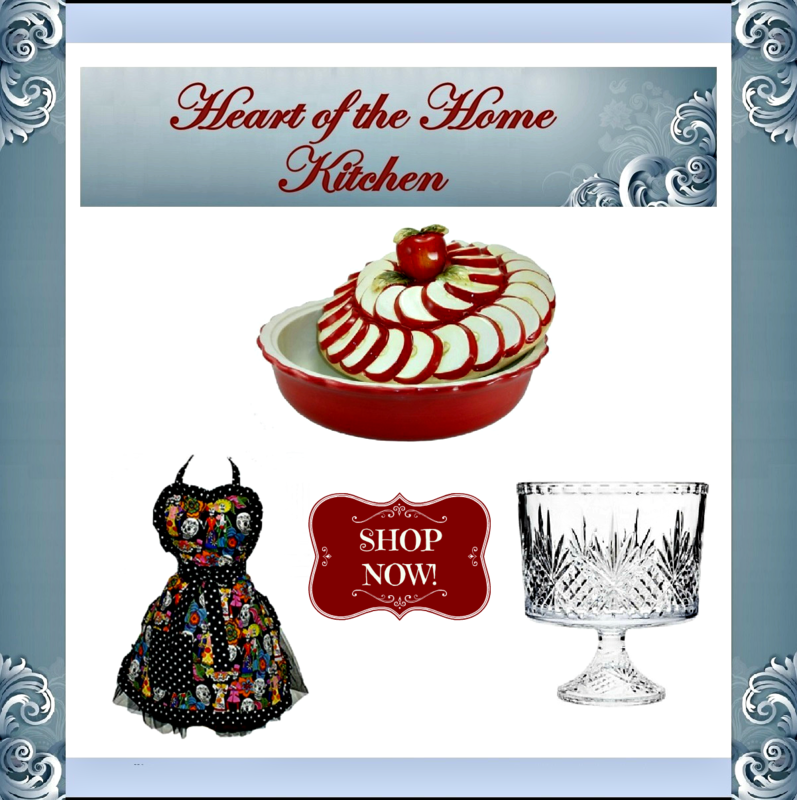 Serve with or without refrigerated Strawberry sauce that you set aside. It makes quite a lovely presentation if you pour a bit of the strawberry sauce on the plate first and set a piece of cheesecake in the center allowing the sauce to show surrounding the cheesecake. Note: You can thin the Strawberry sauce used for serving with water if desired, but don’t use more than 1 tablespoon of water. Garnish with Whole or Sliced Strawberries if desired. I know I have said this before, and I will probably say it another million times before my writing career is over. I grew up thinking Eagle Brand was the name of sweetened condensed milk. I never even realized there was another brand before I was well into my adult years. Eagle Brand was what all of my mom’s recipes listed. I doubt I even realized it was sweetened condensed milk. Now I laugh at that. Eagle Brand is still my preferred sweetened condensed milk. 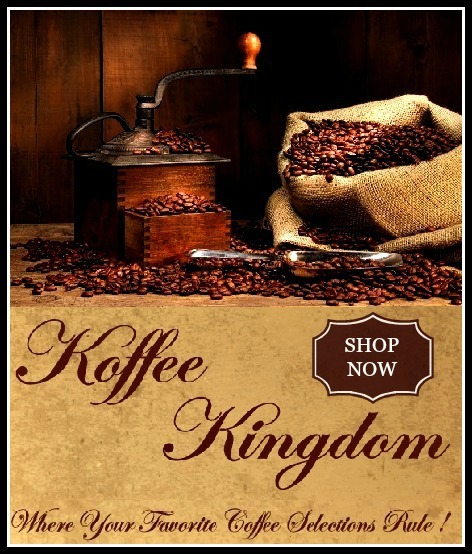 I have tried other name brands and simply do not like them as well. Eagle Brand even tastes delicious alone! A springform pan is my personal preference when baking a cheesecake. I am personally not particularly fond of crust, therefore I like the way a cheesecake baked in a springform pan has only the bottom crust. I also prefer a springform pan that has a nonstick surface. I don’t want to use cooking sprays or grease when I am baking a cheesecake. I highly recommend hand-washing your springform pan. You will want to preserve the nonstick surface and prevent warping that some high heat dishwashers can cause. 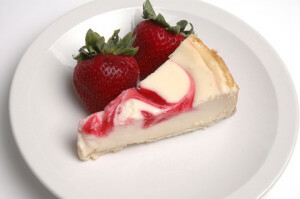 For this Strawberry Cheesecake recipe, I use an ungreased 9 inch springform pan. I have also used a glass baking dish for cheesecake when I am away from home. I have found that not everyone has a springform pan on hand. This is certainly a perfectly acceptable way to make a cheesecake too. You would need to run the crust up the sides to prevent sticking since the glass baking dish does not have a removable side. Also, you will need to decrease the bake time to 45 min – 50 min. when baking in glass. I have never made a cheesecake but you make it sound so easy. Thank you so much for this recipe. It looks gorgeously delicious. This cheesecake sounds so delicious as well as doable. I don’t have a stand mixer so I’ve shied away from making cheesecake because of the thickness of the ingredients. At some point I’m going to have to just try it because we do, indeed, love cheesecake! Did you use a water bath to cook this? Or did you just bake it as is in the oven? I have actually baked this recipe both ways and I can’t tell much difference. It seems to be a more forgiving recipe than some other cheesecake recipes. I have heard others swear by the water bath method, which has made me wonder in the past if weather or climate matters, like it does for candy. Therefore, I would say if you have successfully made cheesecakes in the past by using the water bath, than you might be more comfortable doing that since you are clearly familiar with the method. A Water Bath for Cheesecakes is basically creating a double boiler effect for baking.